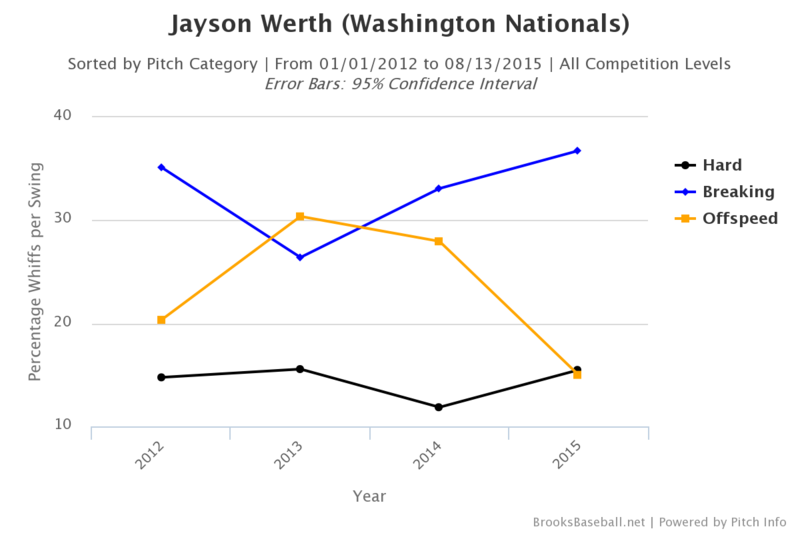 Jayson Werth is not himself these days, and the Nats really miss him. 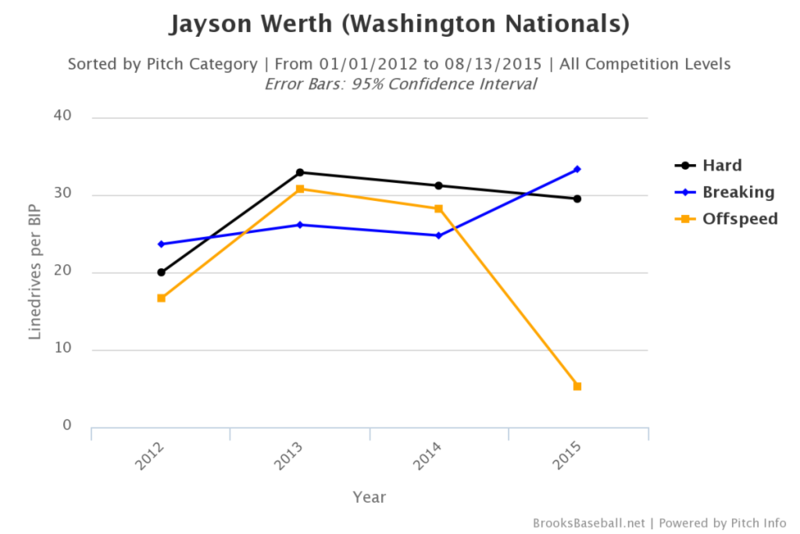 From a poor April and May, to months on the DL, to a dreadful return, this team just isn’t the same without the old Werth. And the new Werth is, well, old (at least for a baseball player). So, is he too old to be an effective hitter anymore? What’s going on with him? It’s not actually much different now than it was in the past. Sure some numbers (inside middle) don’t look as good, whereas for the most part he’s looked better outside of the zone, it doesn’t suggest he’s seeing fastballs, thinking he can catch up, and missing. What’s interesting here is that some of those numbers in the middle of the zone are pretty good. He’s still hitting line drives a decent clip on strikes. But, for a guy who is so patient and has such a good understanding of the strike zone, I was really surprised to see how well he squared up pitches that were out of the zone the last three seasons. Taking a look at the groundball and flyball zone charts weren’t as informative, so I’ll spare you those. 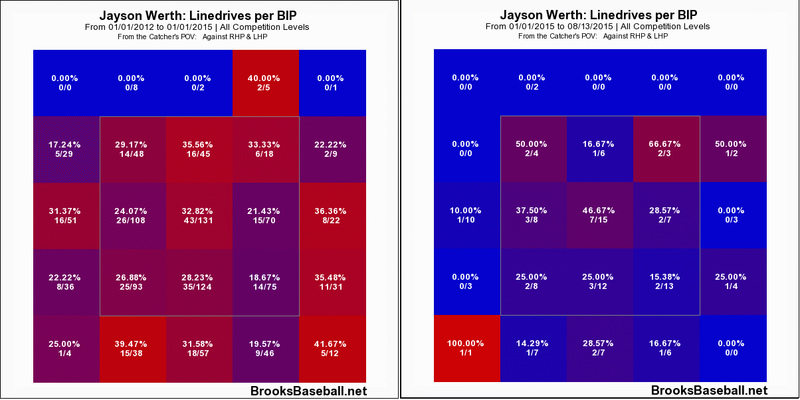 But what I did find interesting was his rates versus different pitches in the time frame. We know his line drive rate on balls in play went down (so we’re not talking about strikeouts here, we’ll get to that in a minute). He’s not hitting the ball as hard, not squaring it up, and it’s turning them into grounders and flyballs. As his line drives overall are going down, there have been an increase on breaking pitches. Menawhile, offspeed pitches are killing him. 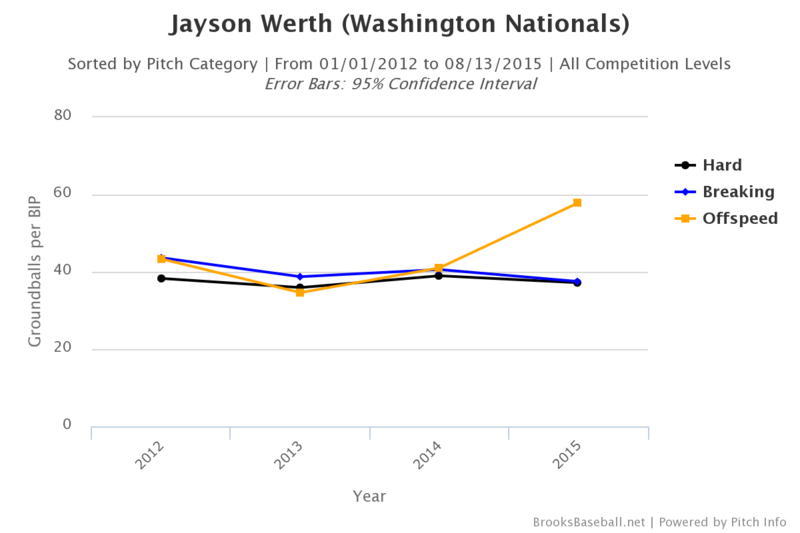 He’s turning a few more fastballs into flyballs, and keeping his grounder rate pretty much the same on them. 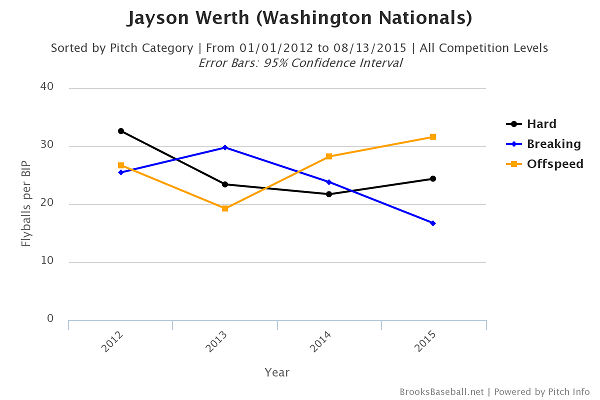 But offspeed (mostly changeups, not curves and sliders) pitches are destroying him. This, to me, is the first hint that his problem really is a pitch recognition/timing issue, rather than just a “can’t catch up to stuff” issue. Taking a look at the same sort of data in that first zone chart – whiffs per swing, but looking at it by pitch, we can see a few interesting things. He is swinging and missing at the breaking pitches more, and making contact with the offspeed stuff quite a bit. And he’s got a pretty consistent rate of swinging and missing at fastballs over the years. 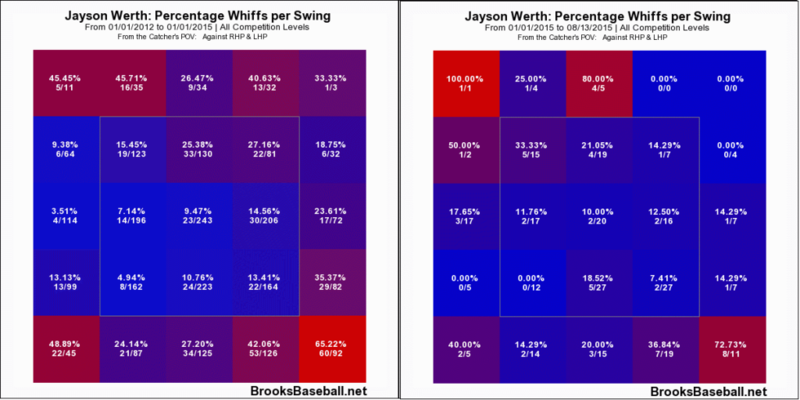 Pack that away for a minute, and take a look at one more zone chart – his swing rates. 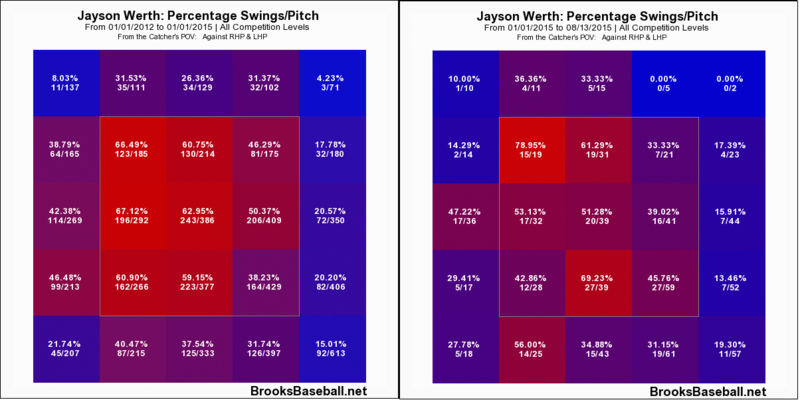 Werth is swinging at fewer pitches, especially outside of the strike zone. This is a guy who used to hit inside pitches well, and isn’t doing it so much anymore. This shouldn’t be surprising, and loss in bat speed that will inevitably come from being over 35 will make it harder to hit hard stuff inside. But it’s that middle of the vertical part of the strike zone that surprises me. That’s a big drop in the amount of time he’s swinging at pitches that are belt-high strikes. What does this all mean? It’s hard to know for sure, but this data can give us some clues. It’s clear he’s not hitting the ball as hard. He’s also not swinging at as many pitches. He’s also not hitting inside pitches that aren’t in the zone well, which he did in the recent past. There are a couple of possibilities, so let’s explore a few that come to my mind. First, let’s say he really absolutely can’t catch up to fastballs, and he knows it. What would he do? He’d cheat on the fastball, and try to adjust to the offspeed stuff. He’d be susceptible to those pitches more, and would hit them with much less power. This is one possibility with what we see here. Hits fastballs well, misses a few more breaking pitches, and taps offspeed stuff softly to infielders. Throw him changeups down the middle all day. Before you get too depressed, though, there is a reason I think that might not be the case. If that was the only thing going on, I think it would reflect in his ability to square up breaking pitches as well, and it hasn’t. He’s hitting them pretty well, although he’s also swinging and missing at them more than he used to, which brings me to a different conclusion. The other conclusion is that he just isn’t seeing the ball great, his timing is off, and his wrist injury has sapped his power, reflected in his overall poor performance. Guys who sit on fastballs would probably hit fastballs pretty well, and he’s not doing that. He is hitting breaking pitches well – when he doesn’t miss them completely. It seems to me this is a guy who isn’t yet comfortable at the plate, and hasn’t fully recovered from injury. He isn’t swinging as much, he isn’t hitting as much, and he isn’t making hard contact. I think if he has turned into just more of a “guess hitter” we’d see a lot more success on the ones he does hit, as opposed to what we are seeing now. If this is correct then the best solution might just be more ABs, which is what the Nats are doing. There’s evidence to support either conclusion, and some pretty good reasons why each one has it’s flaws. But the biggest piece of evidence to me is one number: .394. That was his OBP last year, and it was his OBP over the course of 2012-2014. He never had the skillset to make you think it would all just disappear one day, rather, a gradual decline with an obvious drop in power would seem to fit the bill. I think this is what we will see, and this is what we are seeing around his 2015 slump, rather than a player who is not going to be productive ever again.